The hill of Osoppo, after the small town of Osoppo in the Italian province of Udine, is a 120m high local "mountain" dominating the large fluvial plain of the river Tagliamento. During the Pleistocene the entire area was covered by the Tagliamento glacier, eroding older rocks and depositing glacial sediments. So it is no wonder that the Osoppo hill is composed mainly of sandstone and conglomerate of the Quaternary epoch, however by the particular topography in the shadow of larger mountains the glacier in this spot was not able to erode all of the older rocks - on the steep flanks and the hilltop of Osoppo rocks dating back to the Pliocene and Miocene can be found. The stratigraphic succession is clearly visible along a street leading to the fortress of the First World War on top of the hill. 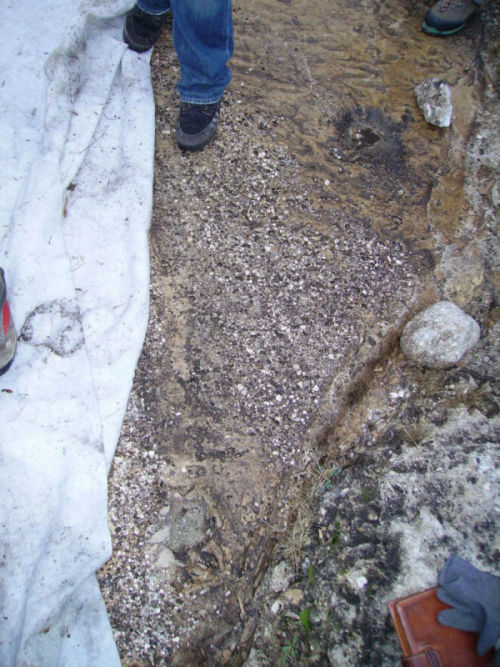 The base of the hill is composed of siltstone interpreted by the presence of limnic ostracods as sediments of a brackish lake deposited during or immediately after the Messinian Salinity Crisis five million years ago. The fine grained sediments are covered by a 110 m thick coarse grained sandstone and conglomerate succession of the Osoppo conglomerate dated to the Miocene to Pliocene. 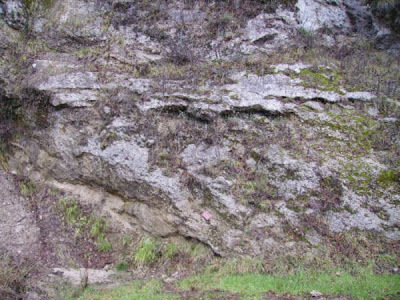 In the apparently homogenous succession of alternating layers of sandstone and conglomerates there is a change in the inclination of the layers. These clastic sediments were deposited in a large fluvial delta entering the sea or a large lake, however the observed changes in the inclination of the foreset beds demonstrate that the river changed over time flow direction and deposited various intersecting overlying sediment units. To the hilltop the foreset beds are truncated by the topset beds of a large river plain. Fig.2. 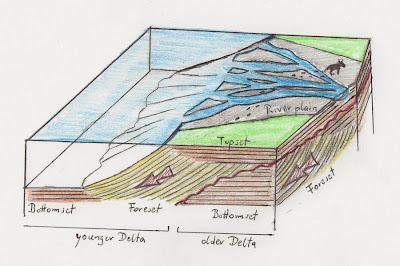 Osoppo conglomerates of the delta complex, the bending of the single layers (the foreset beds of the delta) is observable. Fig.3. 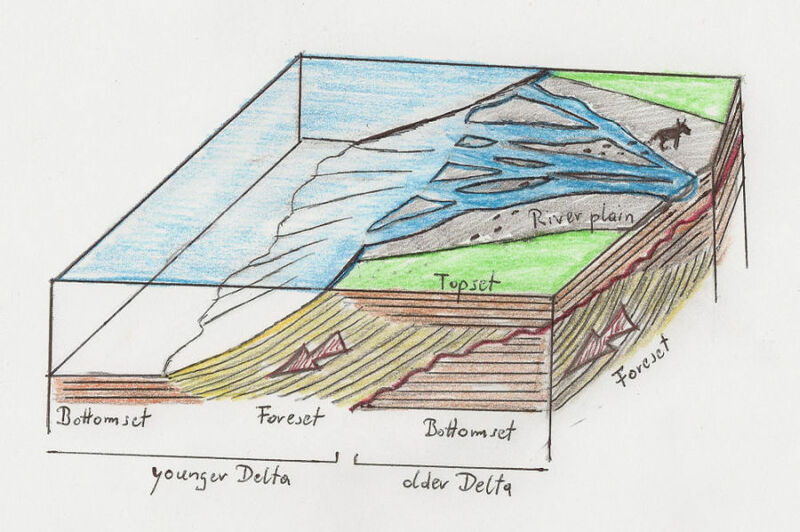 Oversimplified sketch of composed delta geometry, by change of the river flow also the progradation (red arrows) of the delta changes. The hill of Osoppo is not only peculiar by the preservation of such an old delta, more remarkably the coarse grain sediments contain fossils - more precise trace fossils. During work to preserve the crumbling walls of the fortress a surface of the fossil river plain was uncovered, showing various impressions - trackways attributed to various large mammals. Fig.4. and 5. 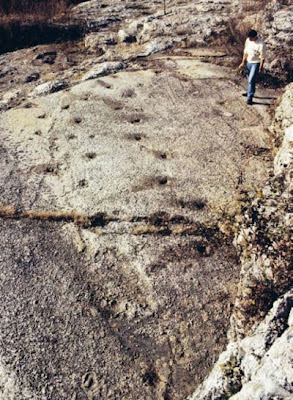 Photography of the Pliocene trackways site in Osoppo in 1994 and map of the exposed surface with reconstructed trackways and geology: signatures 1) conglomerate of former river island 2) sandstone of former channels 3) mud cracks 4) ripple marks. Trackways signatures - Blue: rhinoceros; Red: equid; Green: bovid, after DALLA VECCHIA & RUSTIONI 1996 and Geositi del Friuli-Venezia-Giulia. 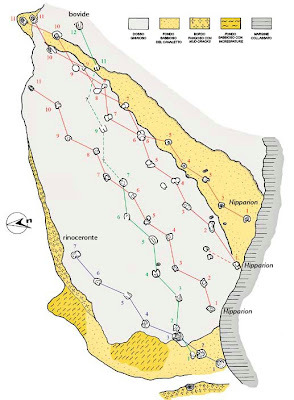 During the Miocene the modern peninsula of Italy was an archipelago of larger and smaller islands, fossils of land vertebrates are therefore rare findings and the exact identification of the makers of the five trackways is difficult. 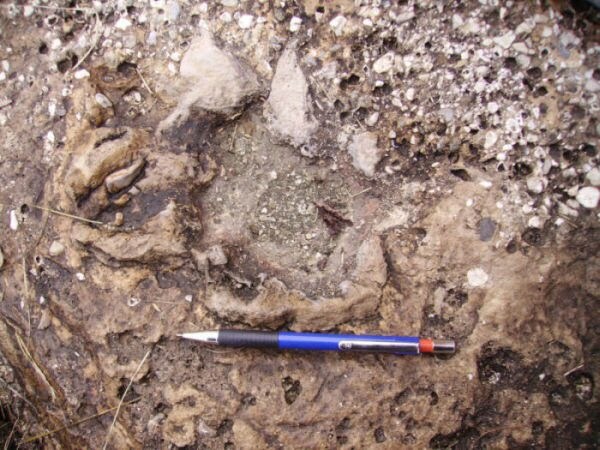 - The first track-morphotype is stubby and very large (15 to 30 cm long) with three toes, these characteristics suggest a large perissodactyl like a tapir or more likely a small rhinoceros. 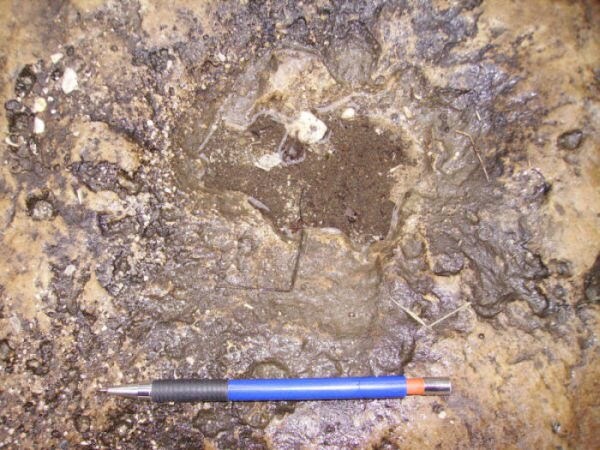 - The second track-morphotype also shows three toes, a central 8 cm large and two smaller lateral toes, preserved only when the central digit pushed deep in the moist sediment - the medial hoof of a three digit horse similar in appearance to the genus Hipparion. 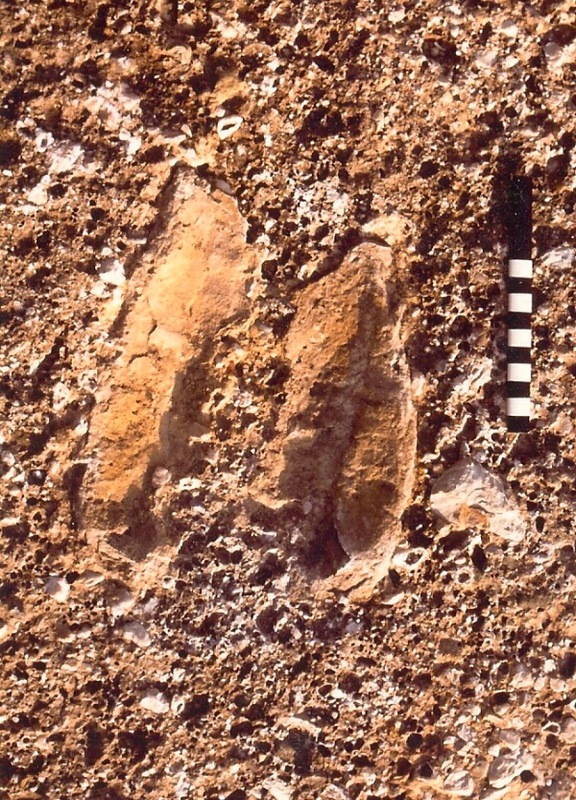 - The third and last recognized track-morphotype is 15 to 20 cm long with two elongated parallel hoof-imprints, attributed to an artiodactyl it is probably produced by a large bovid, cervids appeared only later in the European geological record. Fig.6. to 8. Overview and detail of the weathered ichnofossil of equid (Hipparion ? ), length of pen ca. 14cm. The five trackways are preserved on an ancient island of coarse grained conglomerate surrounded by sandy layers of the river channels. All the animals walked mostly parallel to the direction of the ancient channels, the horses were the first to venture on the river plain, as demonstrated by the deep tracks left in the yet wet sediments, followed by the bovid and rhinoceros, the last trampling on the tracks of the bovid. 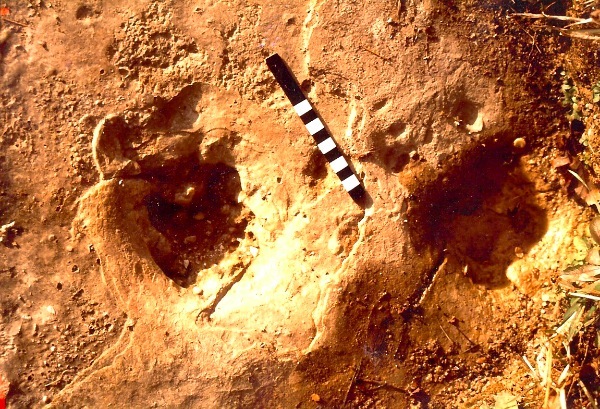 Mammal trackways are not too frequent, but trackways of Hipparion are even rarer, other known examples for example include the site of Laetoli in Africa. It is this rarity that makes the site of Osoppo special. However the actual situation and conservation at the fossil site is not optimal. 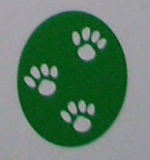 The local authorities provided only a small board (with incorrect footprints similar to a felid species) to advertise the importance of the discovery and after a first excavation campaigns years ago the surface with the tracks was exposed without protection, many of the already poorly preserved tracks were heavily eroded and damaged. Finally the site was covered by a plastic sheet, which however provides only a small shelter and hides the fossil to interested visitors.